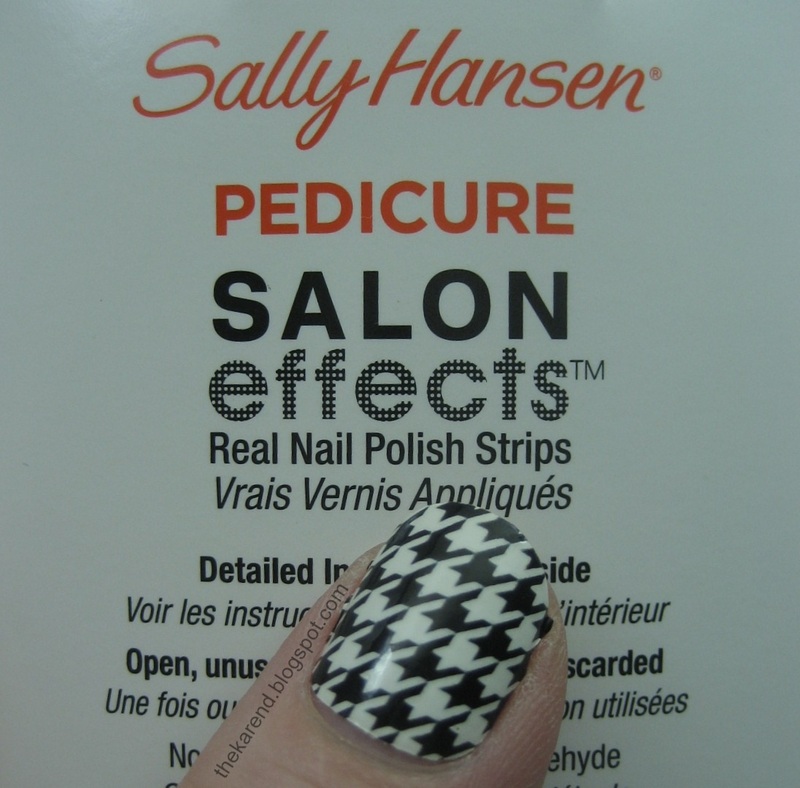 I was once again overdue for a pedicure (I'd worn Wet 'n' Wild Megalast Wet Cement for a couple/few weeks, then gone bare for while), so it seemed like a good time to try another pattern of the Sally Hansen Pedicure Salon Effects strips. If you missed my previous outing with these, you can see Snake Rattle & Roll here—there are toes in that post, which I understand some people like to be warned about. 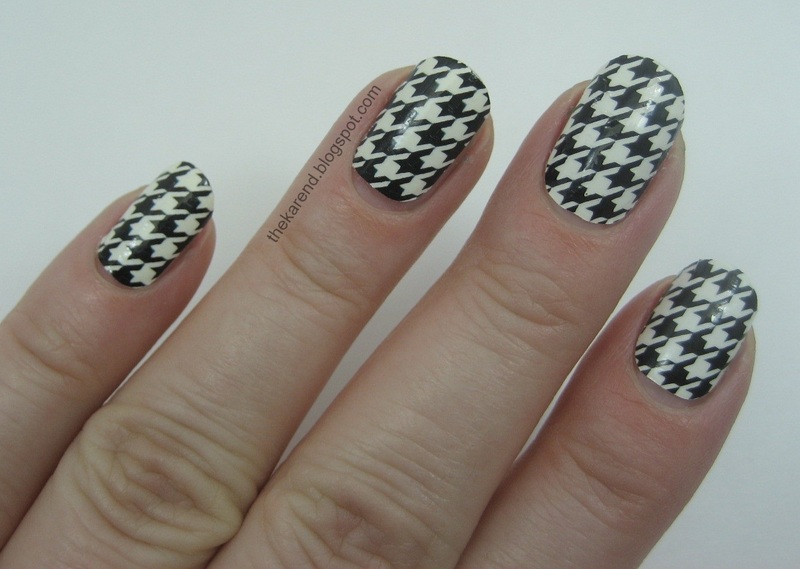 This time I tried Puppytooth, the black and white houndstooth check. As before, doing my toes didn't take nearly the whole package, and I didn't want to waste the leftovers, so I did my fingers, too. If you want to see the toes, click over to Flickr; the distortion you see on my right big toe isn't the strip's fault, it's my nail, which I've been patching for months thanks to a ski boot related injury from last winter. Even though I tried to get as many toes out of the medium sized strips as I could, I had barely enough left to cover my fingers, so in some cases, I have bigger gaps at the base and sides than is ideal. 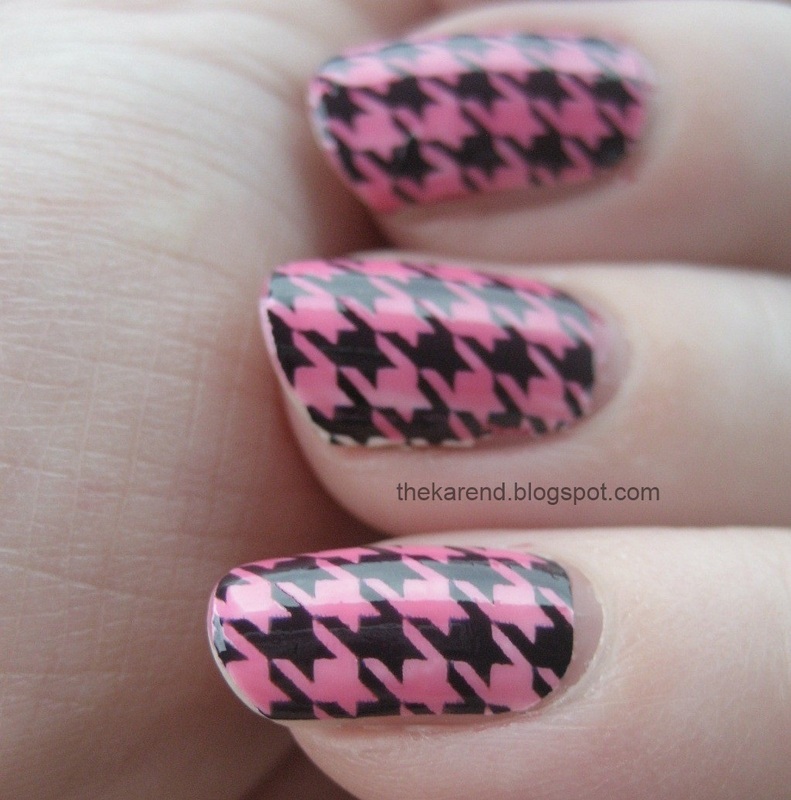 Still, the pattern is so flashy I don't think most people notice the gaps. I really liked the effect of the jelly over this design; I'm thinking jelly Skittles (or ombre or gradient) the next time. 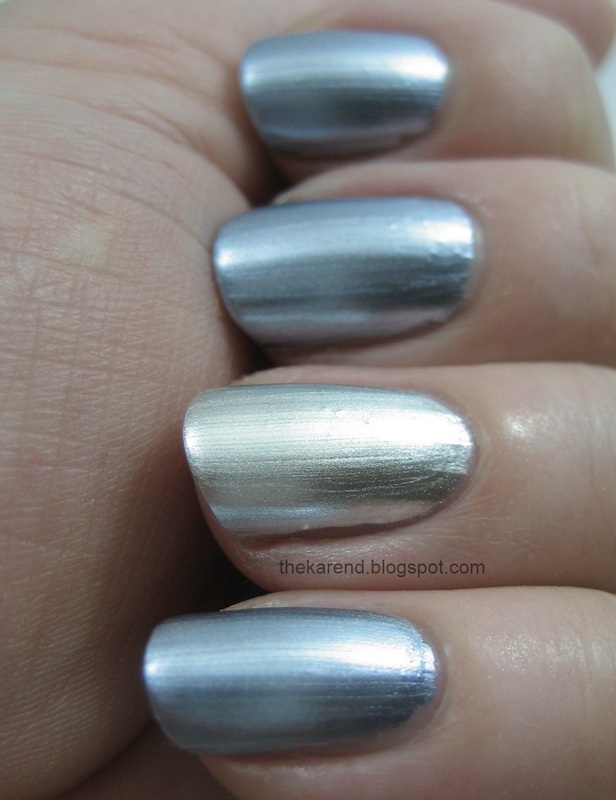 Chrome finishes are often tricky to work with, so I don't reach for them often. 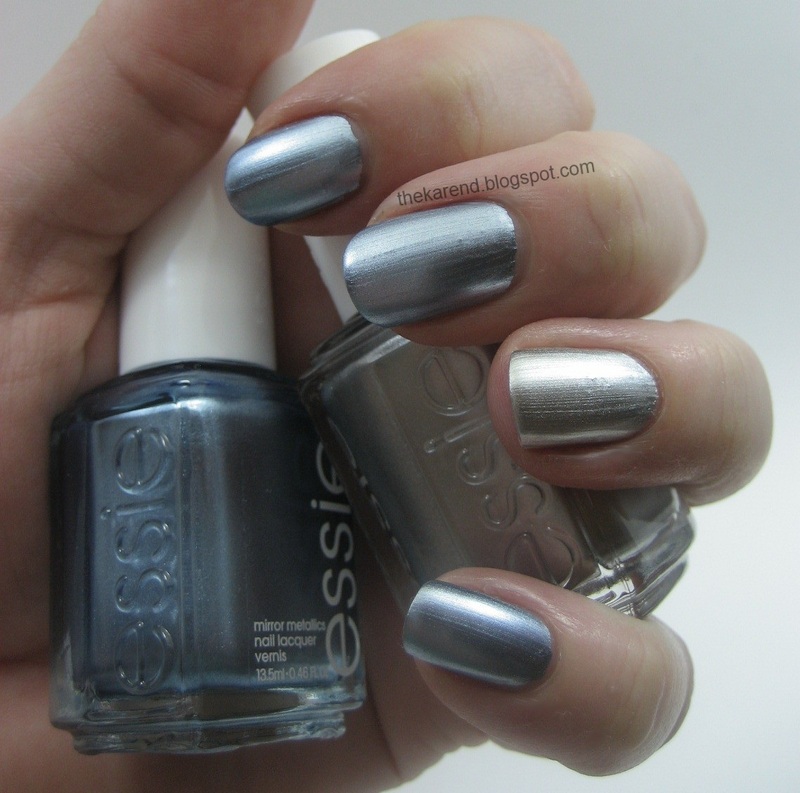 Of course I did not let that stop me from trying a couple of the new ones from the Mirror Metallics collection from Essie. I put on a base of Salon Sciences Instant Artificials to smooth out the imperfections in my nail surface then applied Blue Rhapsody with an accent of No Place Like Chrome. These are very shiny. 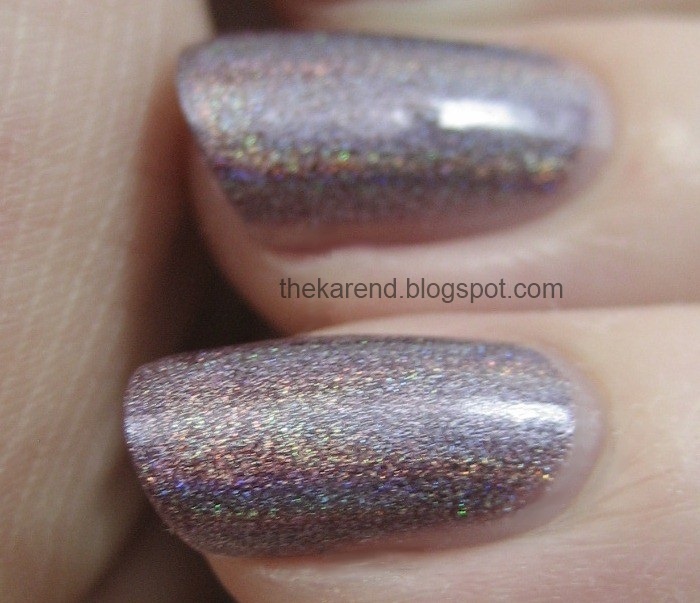 In some shots they were reflecting so much light that my camera couldn't focus properly, and that's without topcoat. They also cover very well. I used two coats, but really could have stopped at one. Careful application is a must, as brushstrokes are an issue; they don't settle as well as I'd hoped (perhaps topcoat would help with that). 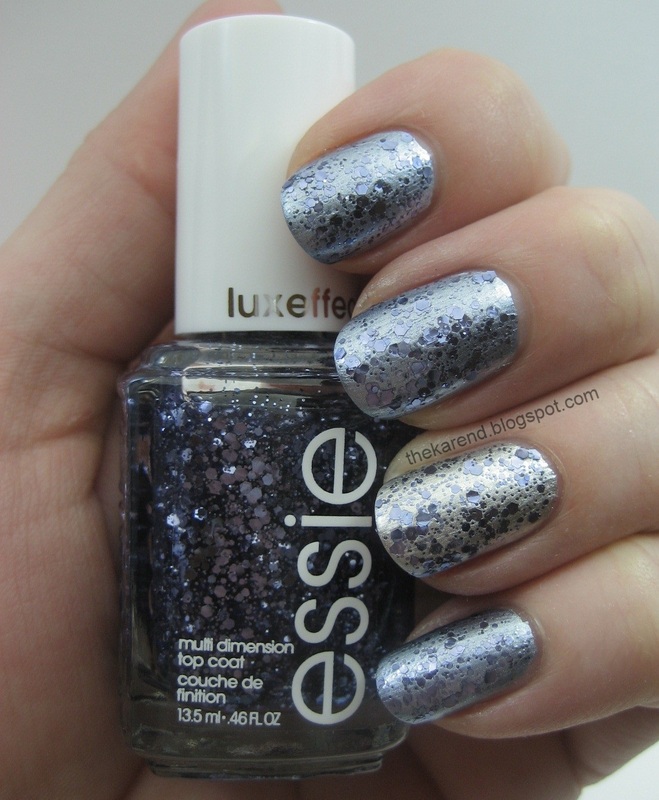 I also picked up the newest Luxeffects polish, Stroke of Brilliance, which is a cool-toned blue glitter. 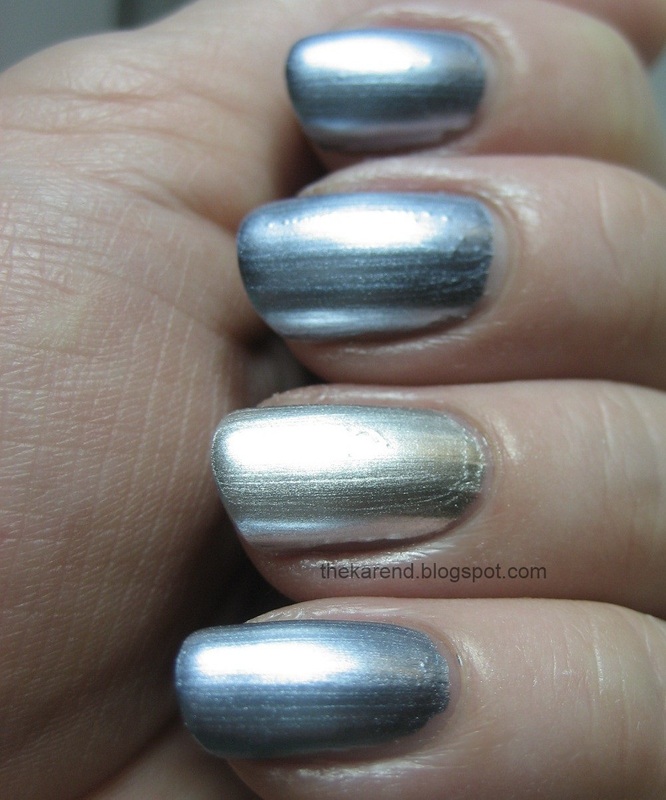 This seemed like good match for the cool-toned chromes I was wearing, so I layered two coats of it on top (still no topcoat; I was extra lazy that day). Stroke of Brilliance is a winner for me. I can think of so many colors it would look good with. I'm not as sure about the Mirror Metallics. I was hoping they'd be easier to work with than my old school Sally Hansen Chrome ones, but they were not. Today I've got what I think is the star of the new octect, Misty Blush. 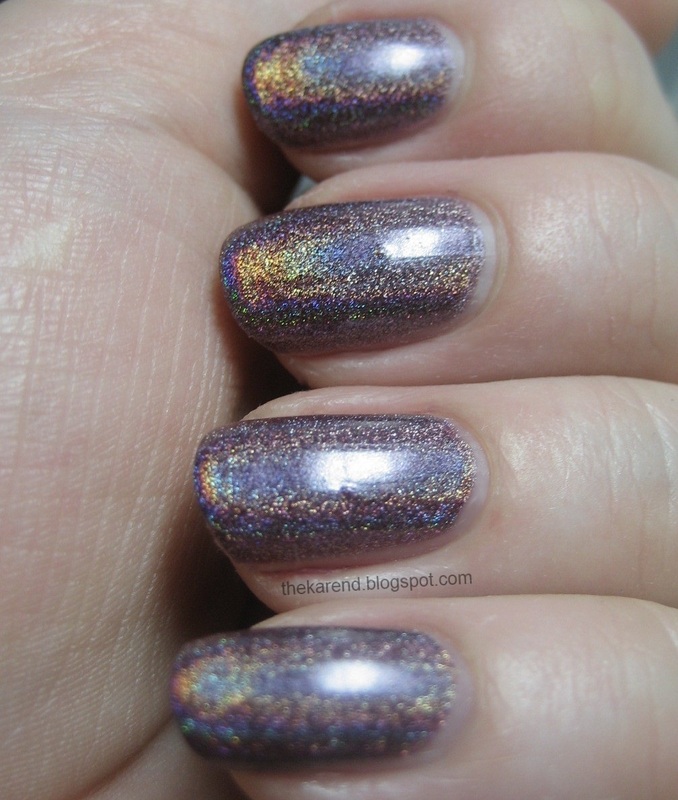 This a plummy brownish purple linear holo. I applied two coats of it over Nfu Oh Aqua Base. 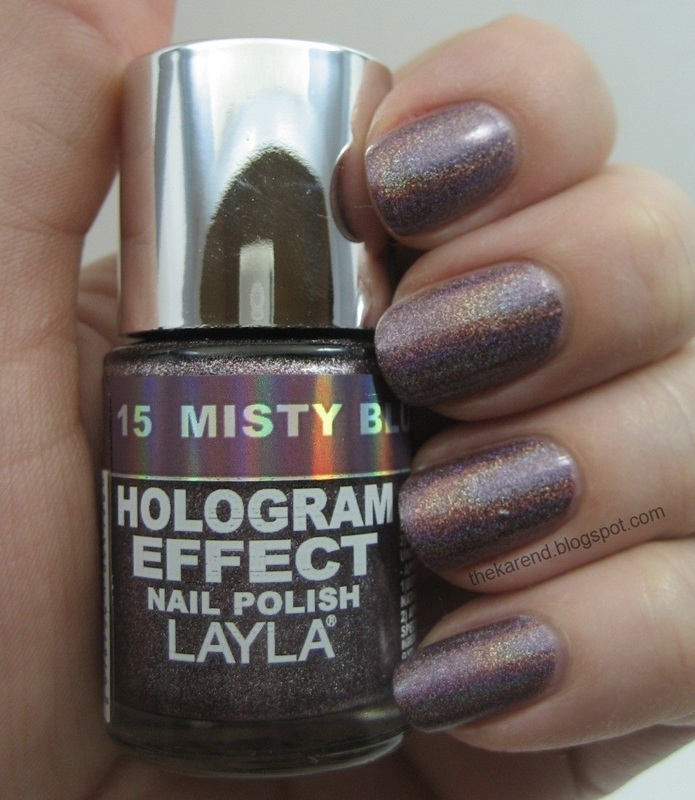 (I bought the Layla Hologram Effect Base File ages ago but am hesitant to try it lest I get carried away and weaken my nails with too much buffing, so Aqua Base it is.) Even in the soft filtered illumination of my lightbox, you can see all the colors peeking out from this. Outside in the sun? Holy crap, look at the rainbows! Sometimes the rainbows are bright and sometimes they're more subtle, but they are never far away. A tilt of the hand and boom! Standing inside with sunlight filtering through a window works too. Is there a corner of your bedroom where the late afternoon light hits at a comfortable height for you to just stand there admiring your nail polish? If so, put on Misty Blush and go there and enjoy the show. 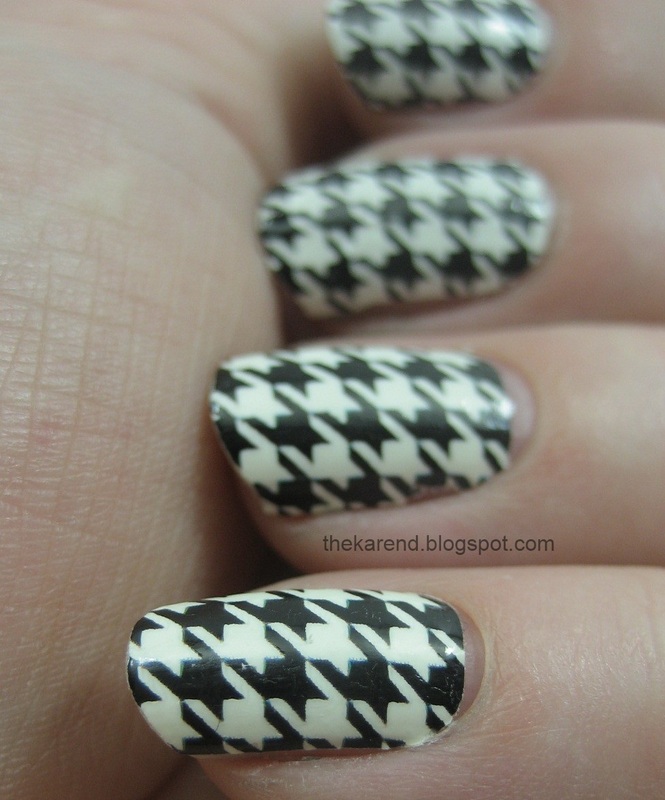 When I put this on, it was just supposed to be a swatching session, where I'd take some pictures and move on to the next polish. But I just couldn't remove it off right away. I had to wear it a while and admire it in more lighting conditions, then take photos in odd places at odd angles, like on my laptop keyboard and my kitchen table. Obviously, I recommend you get this one if you can. I am hoping Ulta and AveYou.com will get this second set like they did the first ones. 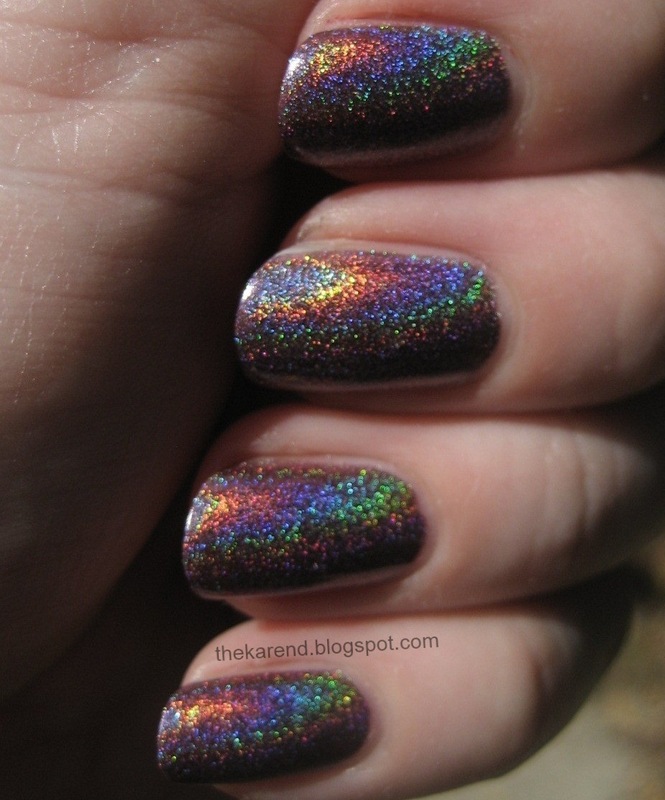 I did see these new colors listed at NinjaPolish.com but shown as out of stock. 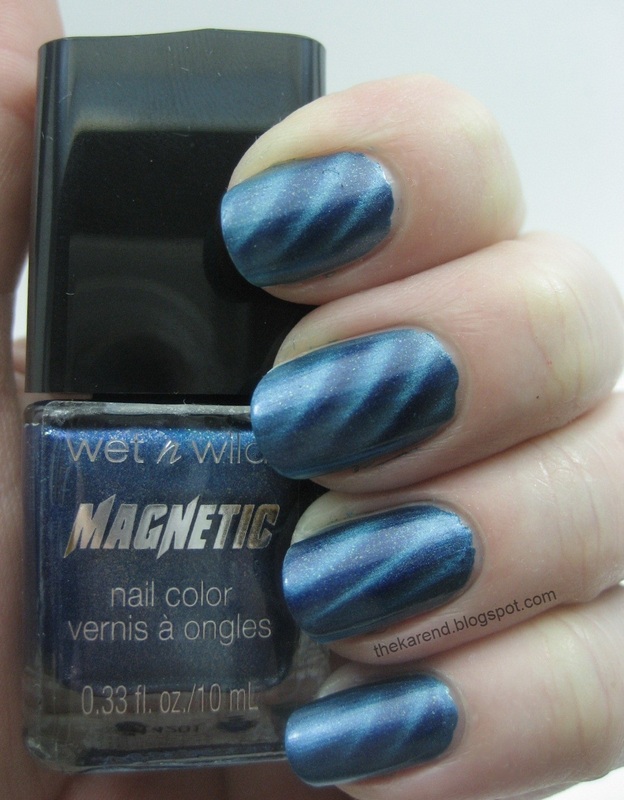 Because the Wet 'n' Wild Magnetics weren't on sale when I found them, I didn't scoop up one of every color as I'm often tempted to do when faced with a new display. 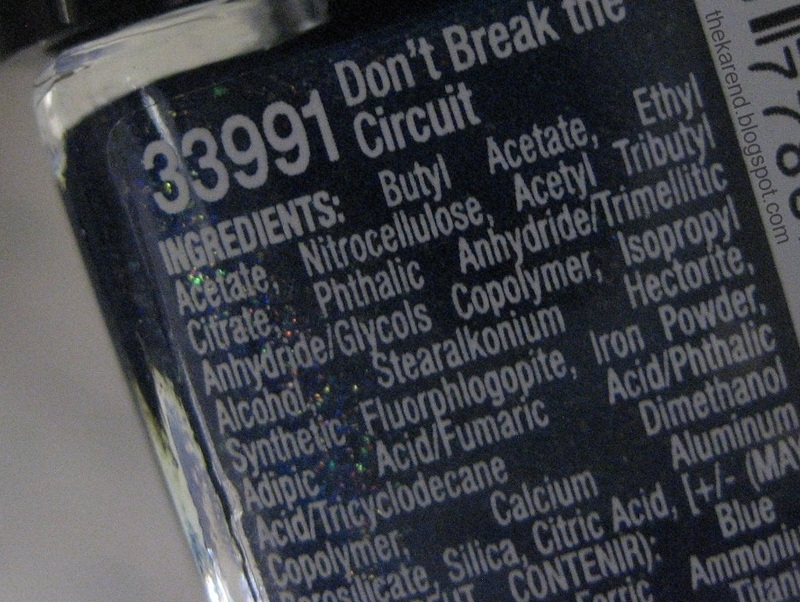 I did get the blue one, Don't Break the Circuit, because it showed some interesting pops of color in the bottle. The directions recommend two coats, but this is opaque enough that I only used one coat on my index and middle fingers and it worked fine. 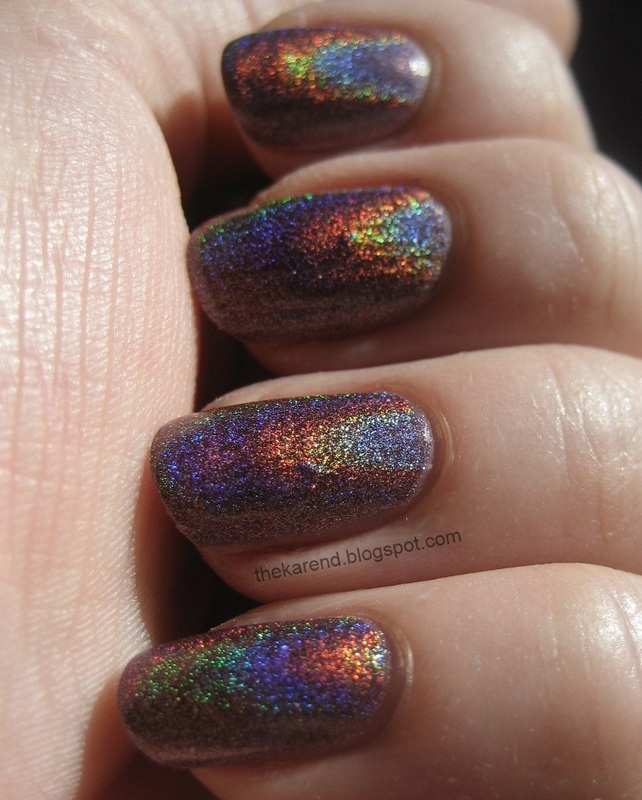 The colors I saw in the bottle weren't as evident on the nail, though I could see some sparks in there. The magnet is attached to the overcap, which slides off the bottle pretty easily, no fighting necessary. 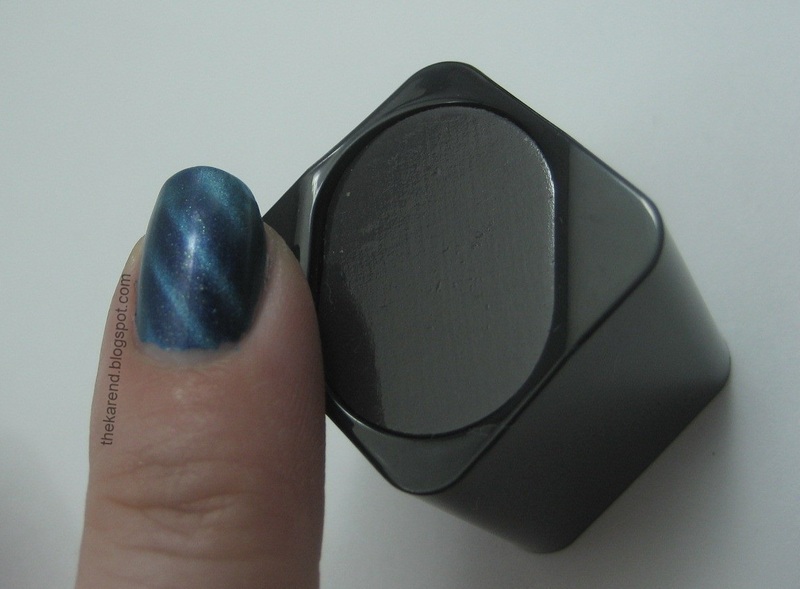 The magnet is a good size; here it is next to my index finger for comparison purposes, and as I've mentioned, I don't have especially small hands. There is no lip on the magnet so it was a bit difficult to position consistently. It was plenty strong, though, as long as I got my nail close enough to it. All in all, I'm happy with this one and will buy more colors if I see them on sale. 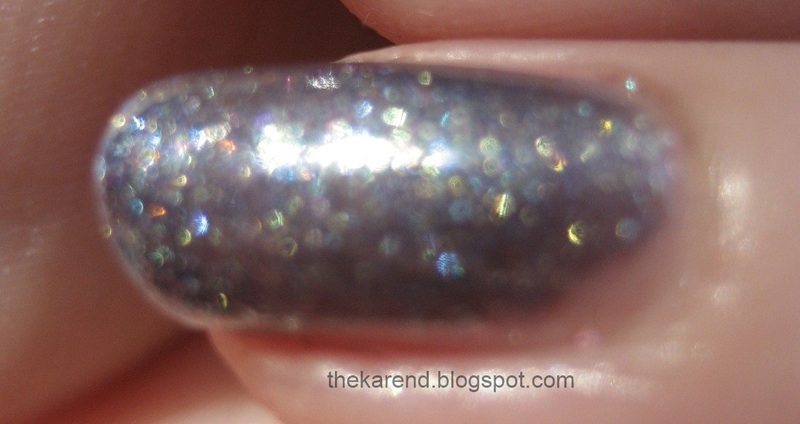 By now most of you reading this will have already heard about how Sinful Colors used photos from nail bloggers without getting permission or giving credit. 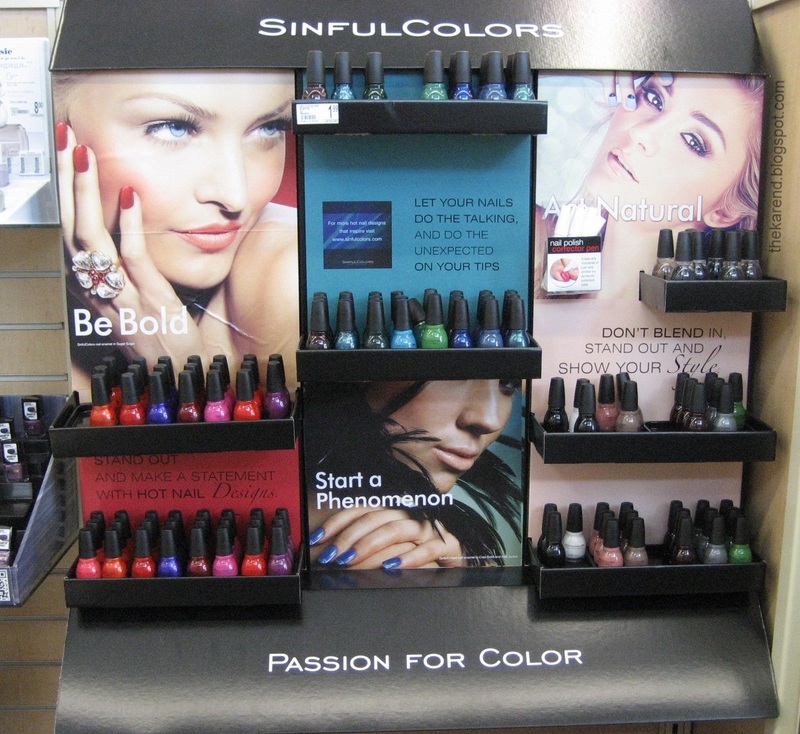 These photos are in an instructional pamphlet distributed with the big Passion for Color display, and the images on the display itself have models with what appear to be digitally created manicures copied from the bloggers' photos. Whether it was an dumb mistake, sloppy oversight, or deliberate act, this is a wrong that needs to be addressed. Apologies need to be made to the bloggers. Compensation needs to be provided to them. 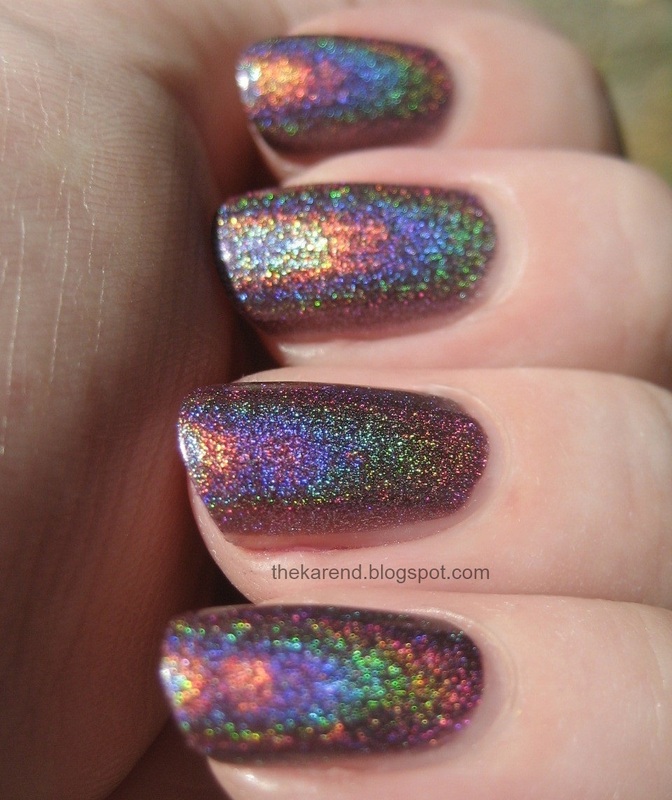 If those things don't happen, I won't feel okay with buying any more Sinful polishes or sharing them or their displays here. I'd feel icky supporting a brand that takes advantage of bloggers. Sinful can make this right; I really hope they do. There are three nail looks featured in the pamplet and on the display. 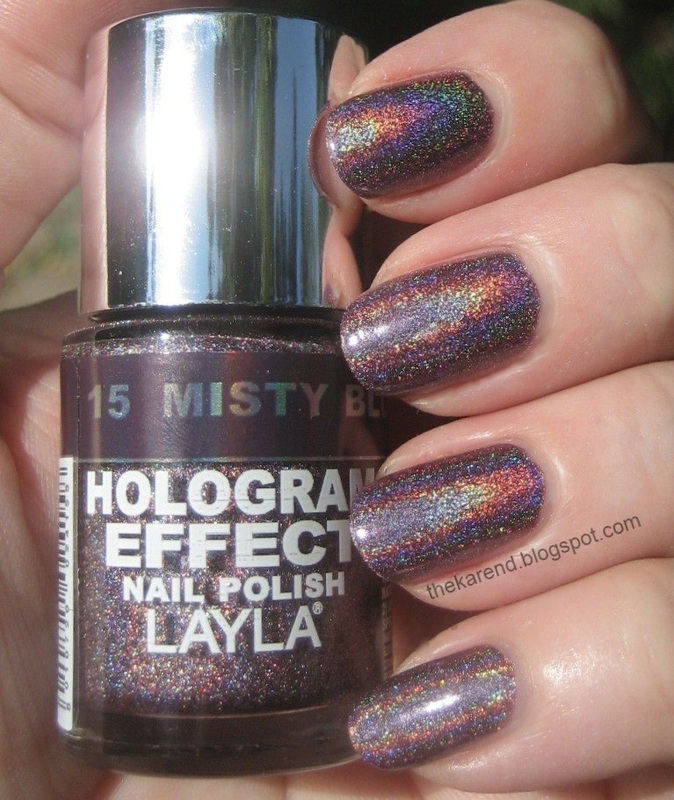 The one that Sinful calls "Sponge Effect" is a glitter gradient stolen from The Swatchaholic. 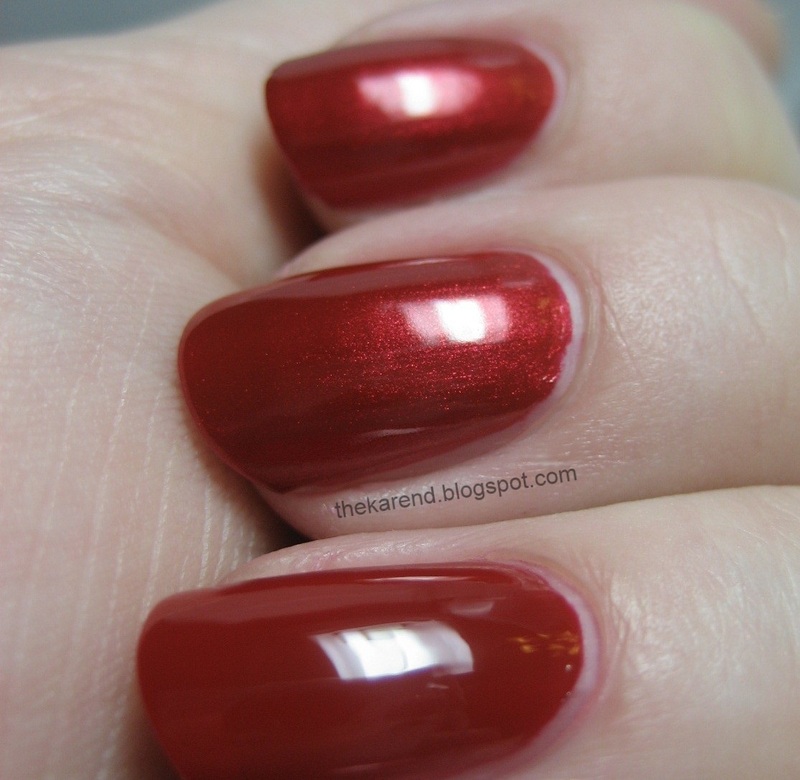 No Sinful Colors were used in the making of that manicure. Infuriatingly, whomever created the pamphlet removed The Swatchaholic's watermark from the original photo. 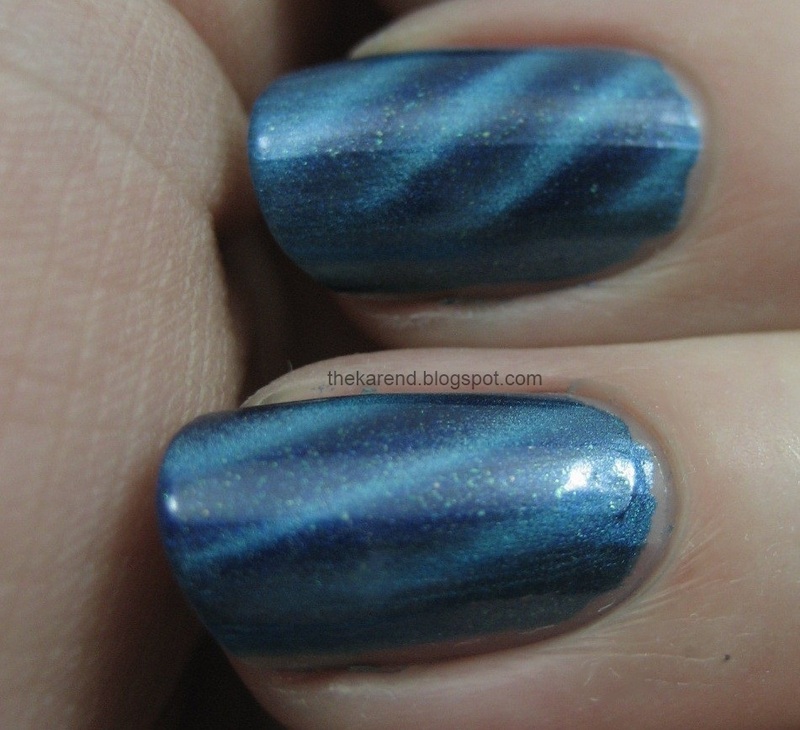 The "Swirl It" manicure is stolen from Swatch and Learn. Again, no Sinful Colors were used. 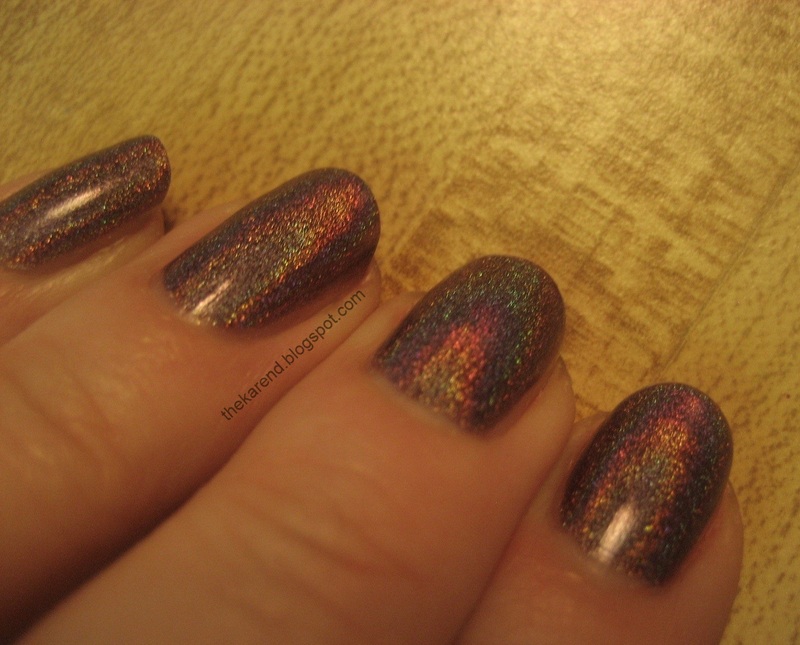 Stupidly on Sinful's part, the manicure they stole images of is a stamped mani, not accomplished with a toothpick as the accompanying text in the pamphlet instructs. Way to mislead your customers, Sinful. I haven't heard where the third manicure, "Half Moon", came from, nor have my own searches turned up anything on that one. I suppose it's possible it was not stolen from anywhere, but I'm very skeptical at this point. Sinful doesn't appear to have an official Facebook page or functional website, so contacting them through those venues is a no go. Revlon, who owns Mirage Cosmetics, the company behind the Sinful Colors brand, does have an official Facebook page, and comments there have been blowing up with this issue. The response so far is "...we are so sorry this happened. It was an unintentional mistake. We want you to know we do respect the rights of bloggers and have reached out to Jeanette to apologize and resolve the issue as soon as possible." Having worked in companies that were owned by other companies, I can believe that no one at Revlon knew what was going on with this Sinful campaign and can understand if it takes a while to resolve this theft perpetrated by their sister company. But it does need to be resolved in a manner that the bloggers involved are satisfied with, or there are a lot of nail polish aficionados who will be purging Sinful from their stashes. There is an online petition created so people can express their desire to have this addressed. I signed. If you haven't and want to, here's the link on change.org. Revlon has posted an apology on the official Revlon Facebook page. It states that they have reached out to the two bloggers, will correct the materials, and are putting procedures in place to prevent this sort of thing in the future. The petition has been closed based on getting the apology from Revlon. The two bloggers linked above have removed the most/all content from the entries I linked yesterday. I take that as a sign that negotiations are ongoing. The MUA member who thinks it's her mani in the half moon photo (and based on seeing another photo of her hand, I agree) hasn't found her original post yet (MUA board search is quite limited). I'm glad to see there's been positive movement on this from Revlon (where Sinful/Mirage is hiding, I have no idea). 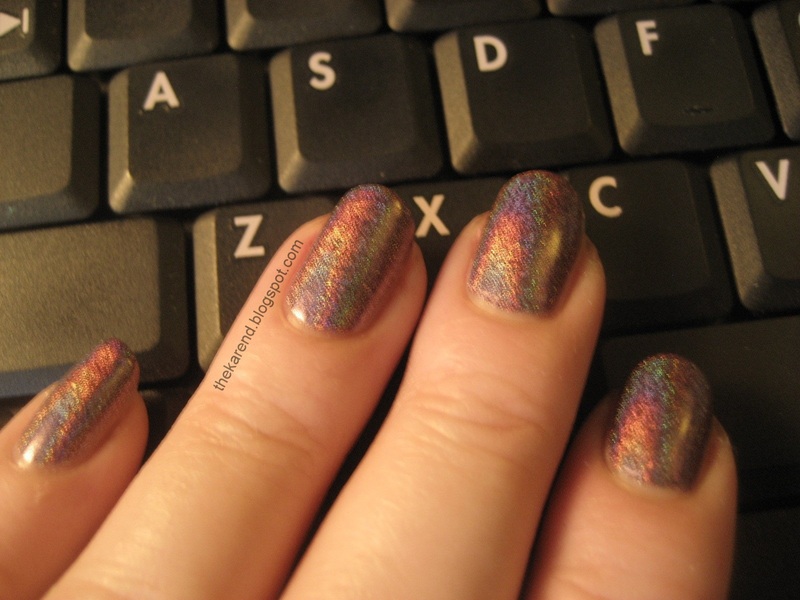 I am hopeful that it will be resolved to the satisfaction of the bloggers in question; when they announce that's the case, I'll let Sinful polishes back on my blog. UPDATE 24-Aug-2012: Because this post is still getting hits, I wanted to add a note here that the companies involved have taken some further action. The big display which had the stolen blogger photos has been updated to cover the two images onto which the bloggers' nails had been placed without their permission. The pamphlets with the stolen photos have also been pulled. I'd still like to hear from the bloggers involved that Sinful has made things right with them personally, but since some positive action was taken, I am going to allow Sinful back onto my blog. 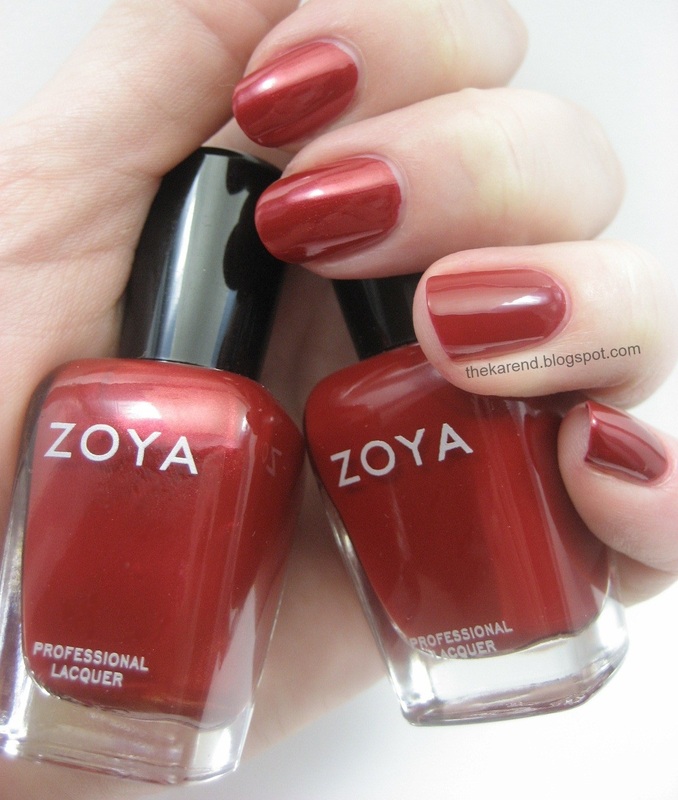 As I mentioned when I shared Zoya Gloss yesterday, the brand has three collections out for this fall. Today, I've got the two bigger ones, Designer and Diva. The Designer collection consists of six cremes (left to right below): Rekha, Toni, Monica, Natty, Evvie, and Noot. The Diva collection is six shimmers: Elisa, Suri, Song, Ray, FeiFei, and Daul. The day I swatched these, I didn't have the attention span to make separate swatches of all twelve colors on their own, so I paired some of them up. I think you'll still be able to get a good idea of how the shades look despite my laziness. One definite drawback to this approach is I still haven't figured out a good way to hold two bottles at once for photos. 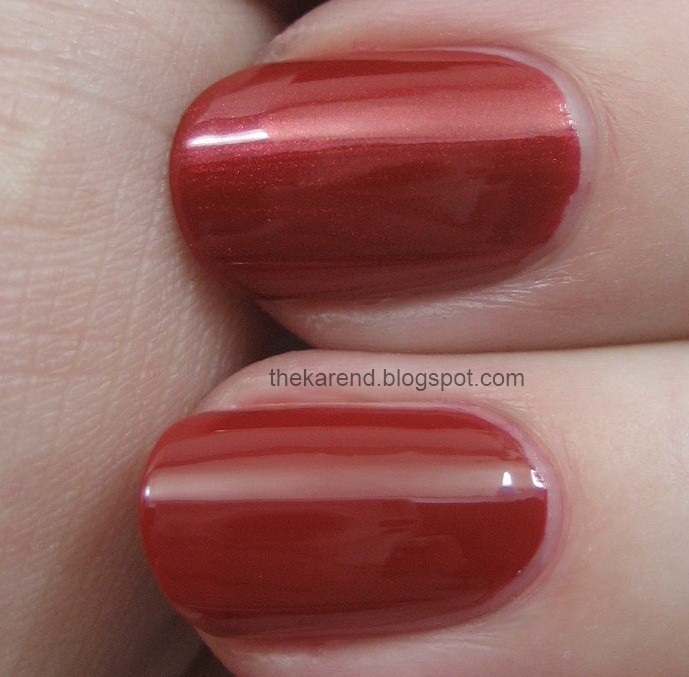 This is Elisa, the red shimmer, with an accent of Rekha, the red creme. Both were two coats. 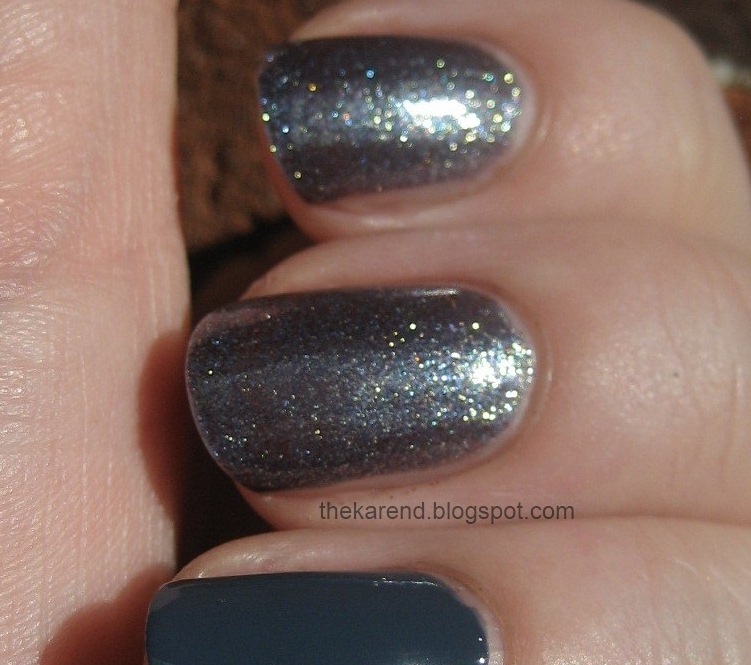 Evvie and Noot are both greyish teal cremes; Noot is the darker complected of the pair. 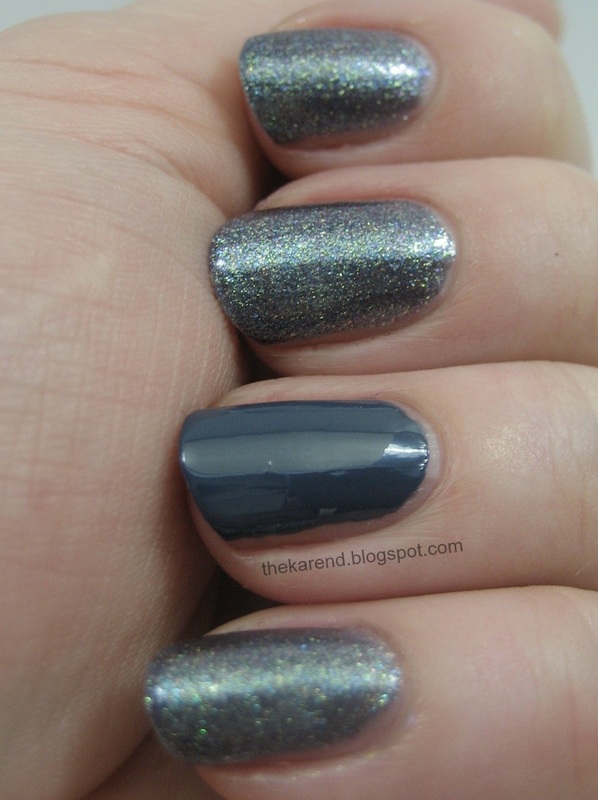 Left to right below: Evvie, Noot, Evvie, Noot (two coats of each). In somewhat lower light, Evvie and Noot don't look that different from each other. Next up, FeiFei with a Natty accent, also known as Karen's favorite couple. 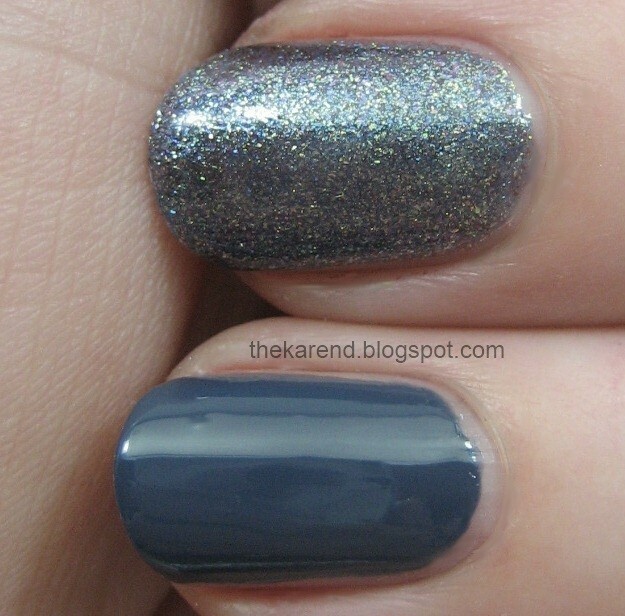 Feifei is a dusty blue packed with mostly metallic shimmer, while Natty is a greyed blue creme that coordinates quite nicely. FeiFei is like Zoya Crystal's sophisticated older sister. 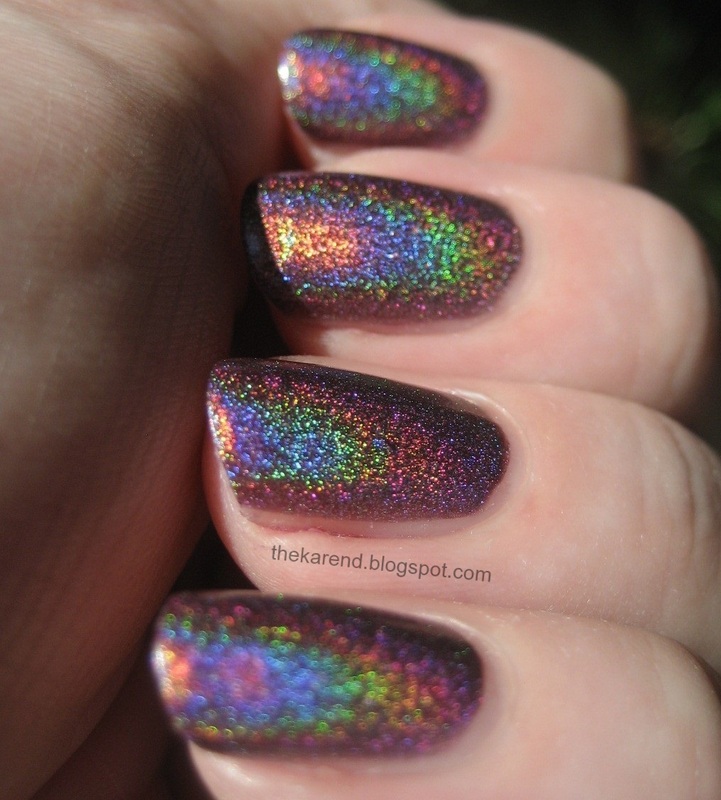 Seriously, are you seeing the sparkles? Toni and Monica are the purple cremes from the Designer collection. Toni is a touch lighter and a lot more red-toned than Monica. 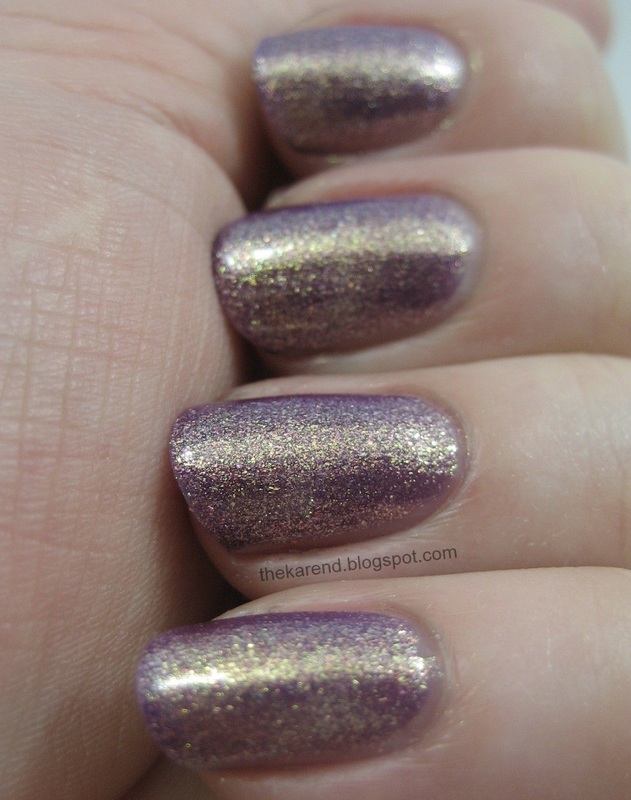 Suri is a cool-tone purple shimmer. 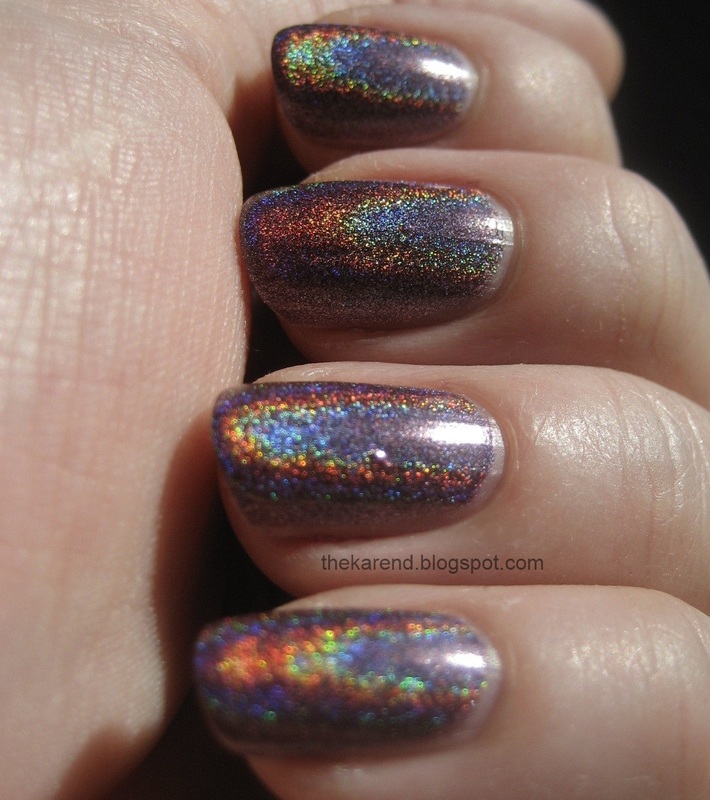 In the sun, the shimmer in Suri pops pink and blue. 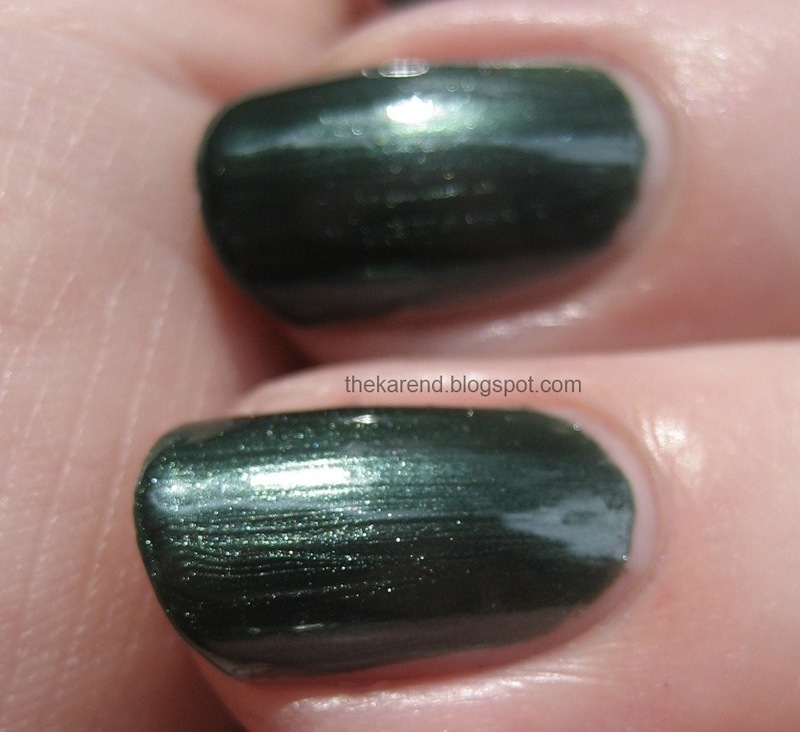 Ray is a dark green shimmer. You may notice bubbling in this swatch; I blame that not on Ray but on it being about four thousand degrees the day I was playing with these (I was painting my nails outside so as not to distress Mr. Karen with fumes—he objects to nail polish and remover smells, and it's not a battle I choose to fight at this point). The sun did not seem to agree with Ray; it mostly just highlighted the brushstrokes. 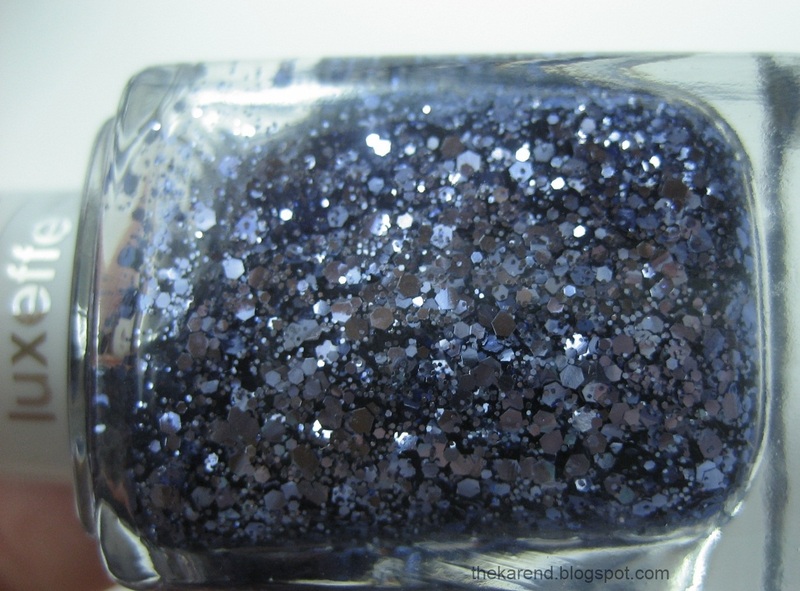 Song is a royal blue shimmer. This one is very pigmented; I think I could have gotten away with one coat if I'd wanted to (yet it did not stain my skin when I took it off). 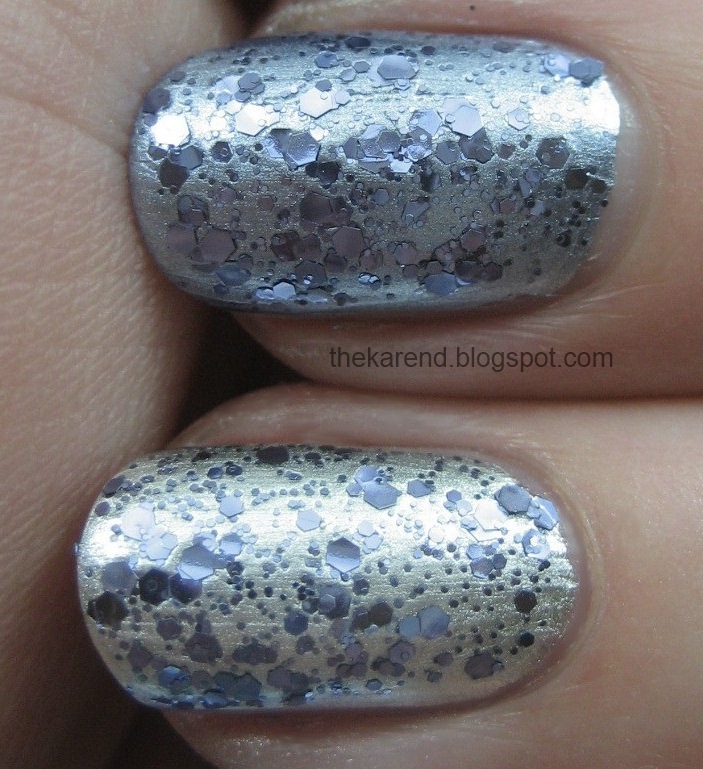 The shimmer in this is very pretty, even in regular room like you can see the silvery blue sparkle. In the sun, Song looks almost foil-like. 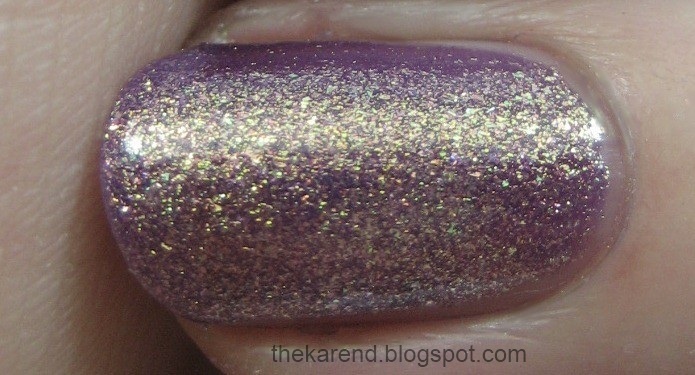 Finally, we come to what I thought would be my favorite based on the bottles: Daul, a purple with lots of mostly gold shimmer. 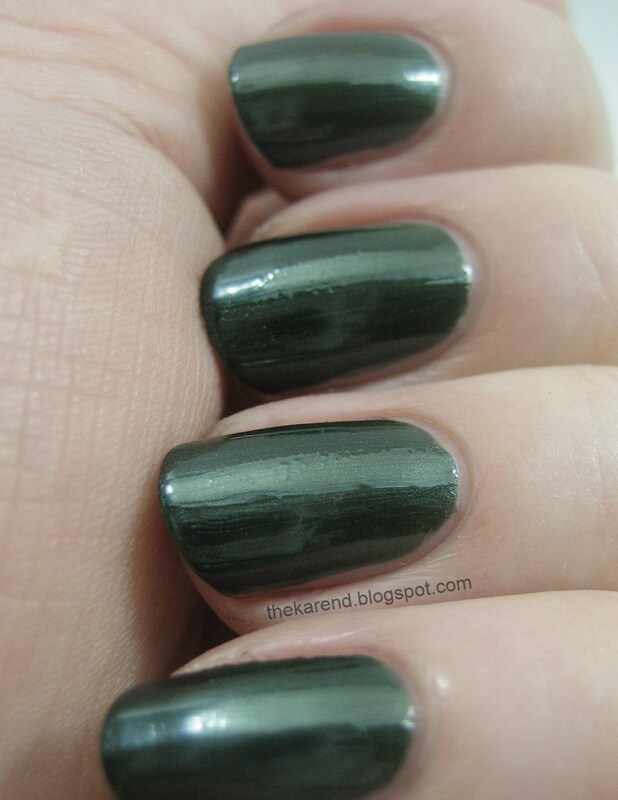 This is similar to Zoya Faye, but not as red-toned. On the nail, the gold dominated too much for my taste; it didn't seem integrated with the base color nearly as well as in FeiFei. Still, it is pretty. I liked Daul better in the sun; the gold was still prominent, no doubt, but there were some pink and purple sparkles to distract me from that. 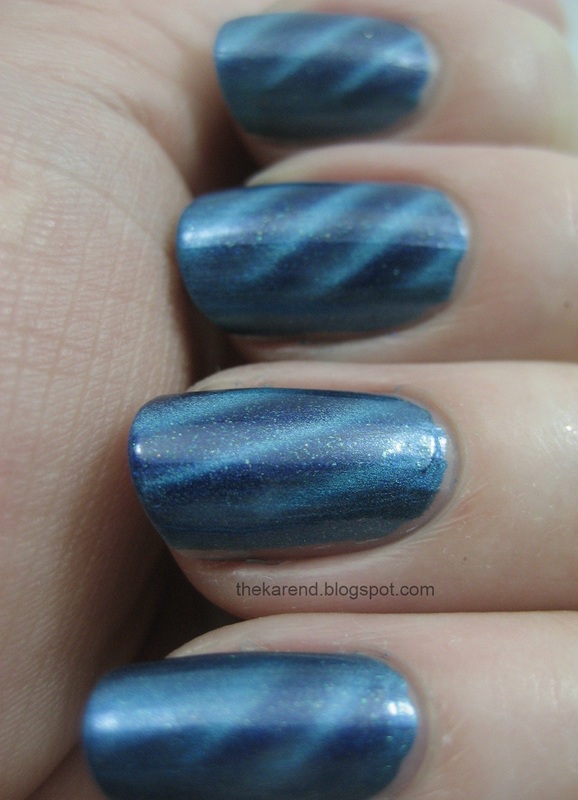 I think FeiFei is a must have if you like blue even a little bit. 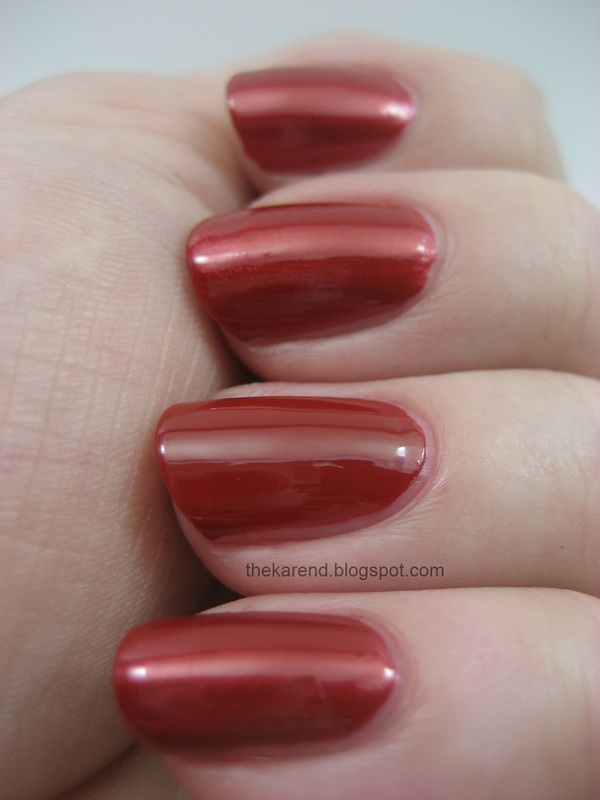 Song is my runner up for favorite of these dozen shades. Maybe I'm not as much of a purple girl as I thought.